Speak Reminder is a simple app that provides a fast way to create a reminder using speech control. With various available speech commands, such as "remind me in 5 minutes", "remind me every Monday at 10 AM", etc., creating a reminder has never been easier and faster. More commands can be found in the Help section of the app. - Show warning message when the speech-to-text description is activated with an unsupported language. 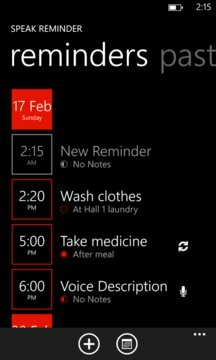 - Have settings to skip asking for description or use speech-to-text description when creating a reminder by voice commands. 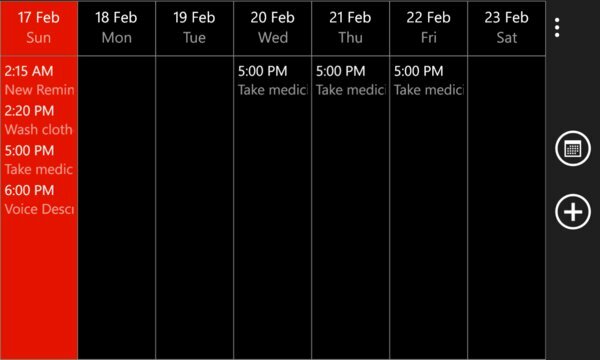 - Have settings to exit the app after a reminder is created by voice commands. - Add the function to add a reminder in a certain period (in 5 minutes, etc.) without using speech. - Support other English dialects: United Kingdom and India. - Stop the speech in the main and edit pages by pressing the Back button. - Add "speech help" section in Help page to show how to activate speech on the phone. - Crash when resuming from tombstone state.